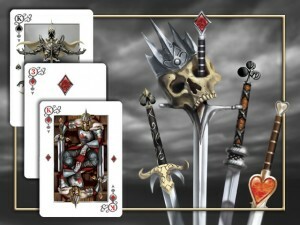 A War of Kings is a set of playing cards with a fantasy artwork twist on them. They're on Kickstarter and looking for funding. A playing card deck where each suit is a distinctly different set of fantasy characters, featuring White and Dark Knights, Fire Mages and Barbarians. There will be 54 custom cards and their own unique tuck box.